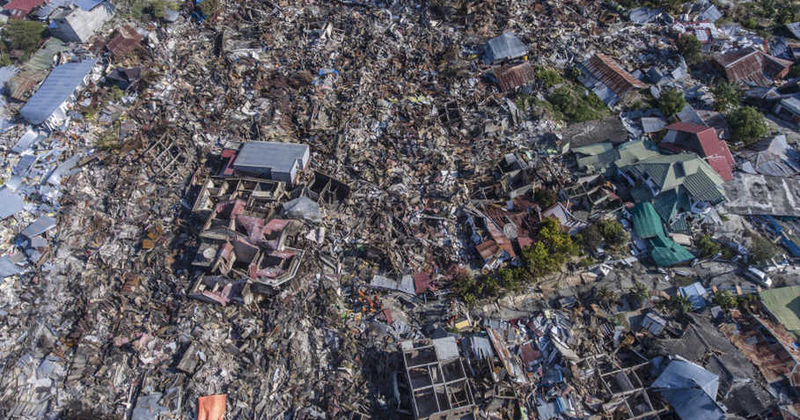 On 28 September, a massive earthquake and tsunami hit the Indonesian island of Sulawesi. More than 2,000 people have been confirmed dead, thousands remain missing and up to 70,000 were made homeless. Infrastructure, electricity and communications were devastated in the affected areas and there is a lack of food, water, shelter and fuel. On Friday 28 September, the cities of Palu and Donggala in Central Sulawesi were hit by a magnitude 7.5 earthquake. The quake triggered a tsunami along coastal areas around Palu, killing more than 2,000 people and displacing roughly 70,000 from their homes. Hundreds of thousands have been affected and the death toll is expected to rise as the recovery work progresses. More than 4,000 vulnerable people in Central Sulawesi who are clients of a microfinance project supported by our partners, Tanaoba Lais Manekat (TLM), have been affected by the disaster. TLM are in the process of evacuating their team there but it will be some months before they are able to locate and assess the impact on the people they serve. They have reported that the situation in Palu is chaotic and desperate as people have no food or water and medical help is limited for the many injured. We have supported projects implemented by TLM for many years and grieve with them during this time. Our Bali partners, Gereja Kristen Protestan Bali (GKPB), are also connected to the area through the Balinese communities who live in Sulawesi. They are still waiting to hear from many of them. Our Southeast Asia Regional Office staff have lost family members and are waiting for news from friends. They are based in Bali and talking with GKPB about how they will respond. Friends, we are asking you to pray for our staff and our partners during this time. We are walking with them as they assess the impact and determine how they are best placed to serve. If you would like to support our partners as they respond to this tragedy, please donate. Share this appeal on your social media and church networks. The media cycle often doesn’t reflect the true magnitude of a disaster like this. By amplifying it you can help show solidarity with our neighbours and grieving partners in Indonesia. Funds raised for the Indonesia Tsunami Crisis are applied to the emergency response and for rehabilitation activities in the affected areas. In the unlikely event that funds raised exceed the amount needed for this appeal, funds will be used for UnitingWorld’s disaster fund, helping vulnerable communities prepare for disasters ($1 spent in preparedness saves $15 in response efforts later – DFAT). To make the best use of our supporters’ money, and to get the best outcomes for our partners, we invest in good management practices, ensuring the careful planning, oversight and evaluation of our work, as well as clear transparent and accountable use of all funds. UnitingWorld uses 10% of funds raised to pay for the administrative expenses of running a fundraising appeal and coordinating disaster response with our local church partners.